The Pacific War Online Encyclopedia: Griner, George W.
Table of Contents Next: Griswold, Oscar W.
George Griner took command of 27 Division during the final stages of the Saipan campaign. The original commander of 27 Division, Ralph Smith, had been relieved by Holland Smith for the history of poor performance by his division. 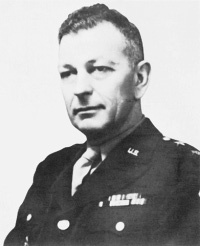 Holland Smith later credited Griner with markedly improving the performance of the division, but Griner came away with a "firm conviction that he [Holland Smith] is so prejudiced against the Army that no Army Division serving under his command alongside of Marine Divisions can expect that their deeds will receive fair and honest evaluation" (Crowl 1958).